Infantigo, also known as Impetigo, which has been a much abused word throughout my medical career. Infantigo, more common in infants and children than adults, is an infection of the skin’s surface that is caused by staph and strep bacteria. 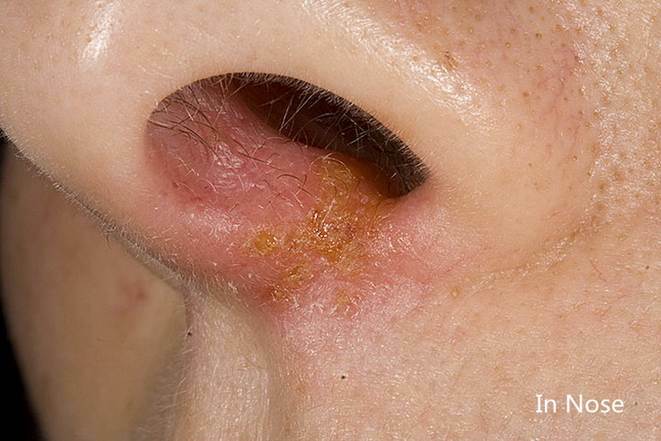 The condition can affect people of any age and it most often affects the mouth and the nose area but sores in other sites of the skin can also be seen. Let’s get to the meat of the discussion. 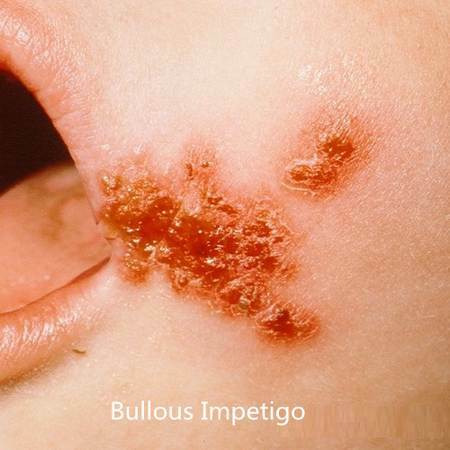 Infantigo is a contagious superficial skin infection. Most cases are caused by staphylococcal bacteria (staph, for short). A lower percentage of cases involve streptococcal bacteria (strep for short). Any break in the skin (such as a cut, scrape or insect bite) can potentially become infected with the germs that cause Infantigo. Because cuts, abrasions and insect bites occur more often in the summer, it tends to be more common during that time of the year. Most children will pick and scratch at the lesions and, in that manner, inoculate the skin with bacteria. Infantigo can also occur when a pre-existing skin disease such as eczema, scabies or chickenpox becomes infected from severe itching and scratching. There are two kinds of Infantigo: Non-bullous and Bullous. Non-bullous – is more common and is caused by both staph and strep bacteria. Small blisters or scabs appear then form yellow or honey-colored crusts. Non-bullous Infantigo usually starts around the nose and on the face, causing swollen glands, but can also affect arms and legs. Bullous – is caused by staph a bacterium that produces a toxin, causing a break between the top and bottom layers of the skin, forming a blister. These blisters can appear in various areas, especially in the buttock area. These blisters are fragile and break, leaving red, raw skin. As we mentioned, the condition is caused mainly by two bacteria’s which lives in the normal skin. The two organisms are the staphylococcus aureus and streptococcus pyogens although the former is responsible for most of the infections. The organisms usually do not cause any infections unless they are allowed to penetrate into the skin through a cut wound or any kind of skin breech. At first the sores look like small red bumps that quickly become small blisters that eventually progress to oozing sores covered by a yellow-brown crust. Obvious pus may drain from the lesions. In the bullous form of the infection, you’ll see larger blisters that flatten out when fluid drains out. The roof of the flattened blister then sloughs off leaving a raw area. 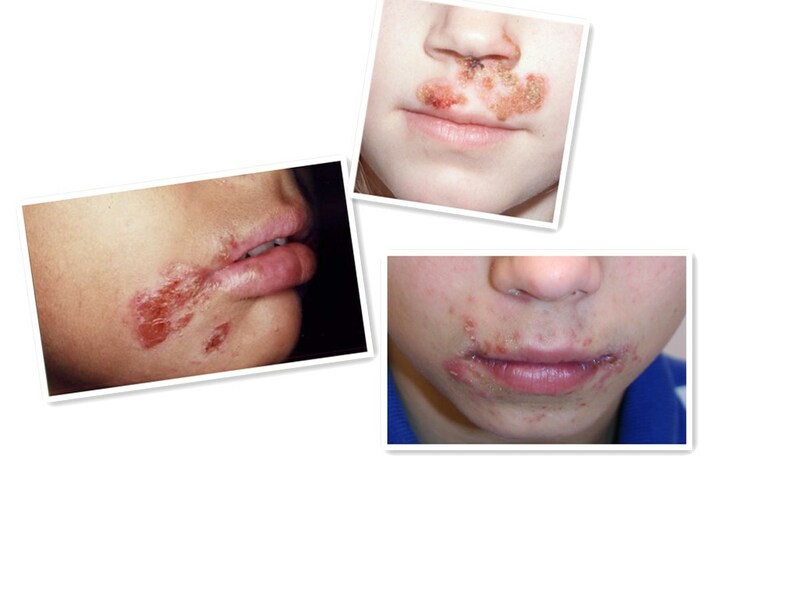 Diagnosis is made by the visual appearance of the sores and laboratory tests are usually unnecessary. What is the sequel of the condition? Children are more susceptible or more prone to being injured as they play and run around. The resulting tiny breeches appearing on the skin would be enough for the organisms to cause an episode of Infantigo. The result of this penetration would be a reddened skin area with blister formation and later on giving rise to pus discharge. The condition will disappear within few weeks but sometimes it can lead to other complications as well. The characteristic feature of this condition is its contagiousness which will make the sufferer himself to spread it from one part of the skin to another by touching or scratching around the wound. A second person can be infected with the disease when submitted to direct contact with the wound or being in contact with a contaminated object or a cloth used by the infected person. Thus, prevention of the disease would have to look at breaking the transmission of the disease from one person to another. How do you keep it from spreading? Try to keep the child from touching, picking or scratching the sores, as this can cause spreading to other parts of the body or to other people. It is wise to keep you child’s hands clean by washing frequently. The child should use his own towels, washcloths and pillows to help prevent spread to other family members. More Ways to prevent Infantigo? It’s vital to avoid direct contact with a person suffering from Infantigo. Thus, touching the wounds directly, using towels and cloths worn by the patient, sharing other objects that come into contact with the skin should be totally avoided and if in contact use appropriate methods to clean the touched surface. Wearing protective gloves will be a good idea when applying ointment to a wound by a second person. Taking a bath daily and using a soap to wash your skin would support in minimizing the bacteria numbers that are colonizing the skin. Thus, it wouldn’t be possible for these organisms to cause an infection such as Infantigo. When there’s a skin breech, it should be cleaned with soap and water and an antibiotic ointment should be applied after drying the wound. Thereafter the wound should be kept clean and prevent unnecessary touching as well. This can be done by asking your child to wear guards and soft padding to areas which are more prone to being injured when involved in sports activities. 5. Seek medical advice if the injury appears dirty, large or signs of infections are present. 6. Wash hands frequently and encourage the children to do the same. Keeping their nails cut short will prevent the infective organisms being present under the nails thus avoiding being washed away. Infantigo is simple to diagnose. Not all blisters mean an infection is present. 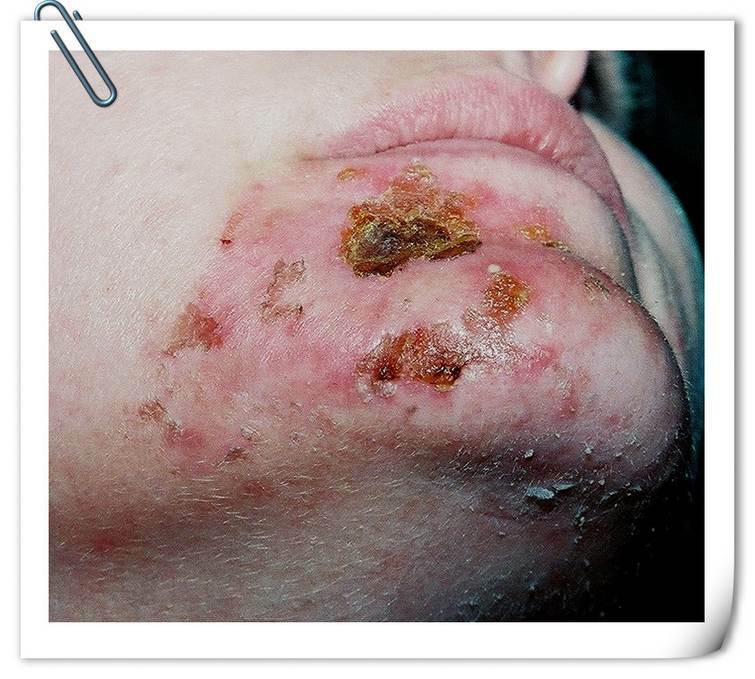 Sometimes other conditions such as ringworm or scabies may look like Infantigo. Other infected and non-infected skin diseases such as, herpes cold sores, chickenpox, poison ivy, skin allergies, eczema, and insect bites can produce blister-like skin inflammation. Infantigo is not a serious condition. In some cases, no treatment is necessary as it will dry up and go away all on its own. Mild cases of Infantigo can be treated by gently cleansing the infected area, remove crusts, and apply a prescription antibiotic ointment such as, mupirocin. More severe cases, especially bullous Infantigo, require an oral antibiotic. An uncommon, potential complication of Infantigo is a kidney condition called glomerulonephritis that causes kidney inflammation. Glomerulonephritis is caused by strep germs and is not prevented by treating Infantigo. Usually no lasting kidney damage occurs. Since Infantigo’s crusts and blisters are superficial, there will not be any scars left behind. The affected skin will look red for a while after the crusts disappear but this redness will fade, usually, within a few days. If you suspect that you have a case of Infantigo and it is not clearing up on its own, seek medical advice as soon as possible. Your physician will be able to give you an accurate diagnosis and begin treatment, an antibiotic ointment can be very effective if only one or two sores are present. If there are large numbers of sores, your doctor will prescribe an oral antibiotic. What about going back to school or day care? Ah, the answer you’ve all been waiting for. Here it goes. If infection is mild (only 1-2 sores), it is okay to attend school or day care as long as you are applying antibiotic ointment and covering with a bandage. If there are multiple sores, your child may return to school/day care after completing 24 hours of oral antibiotic treatment. Be calm. This is not the plague. It is a superficial infection: involves only the very top layer of skin and therefore will heal without scarring. The healed skin may temporarily take on a darker or lighter color over the site of infection. This will clear up with time and is no reason for concern. It responds quickly to appropriate treatment. It is easy to treat.